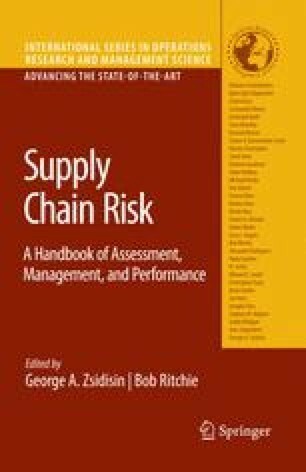 Over the last ten years, supply chain vulnerability (SCV) and its managerial counterpart supply chain risk management (SCRM) have received considerable attention by practitioners as well as academics (see for reviews Jüttner 2005; Peck 2006). Disruptions in global supply chains caused by a sequence of large scale environmental, political and company-driven events provide vivid illustrations of the entwined global marketplace that characterize today’s supply chains. At the same time, they have demonstrated the limitations of conventional risk management approaches emerging from a single company context. However, supply chain risk management approaches must have a broader scope than that of a single organization in order to capture the risks caused by the linkages among multiple supply chain parties and their subsequent ripple effects. Thus, based on the consensus in the literature that a supply chain at its simplest degree of complexity comprises at least three entities: a company, a supplier and a customer (Mentzer et al. 2001), it has been suggested that any approach to managing risks in the supply chain should adopt the same cross-company, supply chain orientation (Jüttner et al. 2003; Ziegenbein 2007). This condition increases the complexity of the managerial approaches sought as well as the resource requirements for their successful implementation. As a consequence, it appears that mainly large companies that typically have substantial control over supply chain activities and possibly act as the ‘channel captain’ are in position to effectively manage supply chain risk. The few existing contributions reporting on companies’ experiences with the implementation of SCRM seem to support this view. They seem to focus on large, international enterprises with abundant know how and financial resources such as the telecommunication provider Ericcson (Norrman and Jansson 2004). For small and medium sized businesses (SMEs), which are increasingly trading globally and therefore exposed to similar global supply chain risks as their large international firm counterparts, it is more difficult to manage risks since they are missing the necessary resources, structures and processes (Ritchie and Brindley 2000). This is even more concerning when considering the fact that SMEs are often affected disproportionately by supply chain risks. As second or third tier suppliers, in many supply chains they have to shoulder a significant size of the risk burden which is pushed upstream in the supply chain by the other parties. In a large project on SCV conducted in England in the time between 2000 and 2003, interviews with managing directors of 15 SMEs revealed that the requirements of SMEs for SCRM approaches differ substantially from those of larger businesses (Cranfield University 2003).